Toner People is founded and run by an IT professional with many years’ worth of knowledge of the industry. We are therefore able to provide you with sound advice and information regarding the huge amount of toners and inks, both compatible and remanufactured, which are available to order. Most orders are sent by 24 hour courier free of charge to the customer but we know that sometimes a cartridge can run out at a frustrating moment and so we can deliver to you guaranteed next day for a small delivery charge. As well as providing high-quality toners and inks we are known for our excellent customer service and continually receive 5-star reviews. There is a myth that Dell compatibles and remanufactured toners and inks invalidate a printer’s warranty but this is not so, therefore you can confidently buy from us and save a lot of money at the same time. Please feel free to contact us by email at sales@tonerpeople.co.uk or by phone on 01765 691000 and we will be more than happy to help you with any queries you may have. It is also possible for you to order by phone should you not wish to do so via the website. 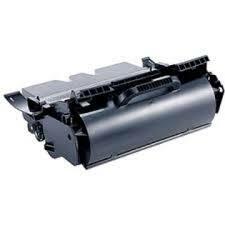 Remanufactured Dell 593-10001 (593-10011) black toner cartridge for the Dell 5210, Dell 5210n and Dell 5310 printers. Page yield is 20000 at 5% coverage. Images may be the set. In most cases, delivery will be next-working day when selecting the free, 1-3 day option at checkout. To guarantee a next-working day delivery, please choose the next-working day paid option at the checkout. Our cut-off time is 15:45 Monday to Friday. We select premium, quality products from manufacturers who have supplied us since 2009 and have a proven track record of providing high-quality toners and inks. Products are manufactured to the highest specification and certificated against ISO-14001. If you’re keen to place an order for Dell 5210 toner cartridges then make sure you do so in advance. If you place your order before 15:45 then it will be dispatched on the very same day via one of our three couriers; Parcel Force, FedEx and Royal Mail. You can select our free service, which delivers between 1 to 3 days, but usually lands on your doorstep in one day, or you can pay for our guaranteed Next Day Delivery service, just in case you need your Dell 5210 toner cartridges in a hurry. We are so confident in our range of Dell 5210 toner cartridges from our amazing partners, including Dell, that we offer a no questions asked returns policy. This means that your Dell 5210 toner cartridges will work with your home or office printer, and that it will not void your hardware warranty. If you have any problems with your product or delivery at all then we are readily available via phone or email to help. Should the issue be with faulty Dell 5210 toner cartridges we will quickly provide a replacement or a refund within 24 hours.